Daniel E. Lynch - Attorney | Lynch Seli, P.C. Dan graduated from the University of Richmond School of Law, Richmond, Virginia in 1987. Following law school, Dan completed a clerkship with the Supreme Court of Virginia. He is a 1984 graduate of James Madison University, and served on the JMU Alumni Association Board of Directors from 1997 through 2004. Dan is AV Peer Review Rated by Martindale-Hubbell, their highest rating for legal ability and ethical standards. He has been elected to The Fellows of the American Bar Foundation.Dan’s practice consists primarily of the defense of workers’ compensation claims, motor vehicle liability claims, premises liability claims, and other liability matters. Dan has defended more than 1000 claims before the Virginia Workers’ Compensation Commission, and he has defended more than 250 liability cases. Dan’s litigation practice includes significant experience with jury trials, bench trials, hearings, appeals, and mediations. Additionally, he has been a frequent lecturer on workers’ compensation topics for the Council on Education in Management, among other organizations. He is a member of the Virginia Workers’ Compensation American Inn of Court.Dan authored the articles on developments in Virginia workers’ compensation law in the 1997, 1998 and 1999 Annual Survey of Virginia Law issues of the University of Richmond Law Review. Also, he was included in Virginia Super Lawyers in workers’ compensation for the years 2008-2009, and 2012-2018. 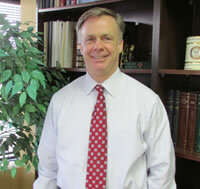 Dan is licensed to practice before all state and federal courts in Virginia and before the U.S. Supreme Court. He is also a member of the Virginia Association of Defense Attorneys, the Virginia Bar Association, and the Richmond Bar Association (Member, Board of Directors, 2007-2011; 2012-2016; Executive Committee, 2016-).